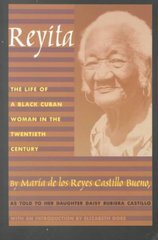 Reyita 0 Edition María de los Reyes Castillo Bueno (1902-1997), a black woman known as "Reyita," recounts her life in Cuba over the span of ninety years. Reyita's voice is at once dignified, warm, defiant, strong, poetic, principled, and intelligent. Her story--as told to and recorded by her daughter Daisy Castillo--begins in Africa with her own grandmother's abduction by slave-traders and continues through a century of experiences with prejudice, struggle, and change in Cuba for Reyita and her numerous family members.Sensitive to and deeply knowledgeable of the systemic causes and consequences of poverty, Reyita's testimony considers the impact of slavery on succeeding generations, her mother's internalized racism, and Cuba's residual discrimination. The humiliation and poverty inflicted on the black Cuban community as well as her decision to marry a white man to ensure a higher standard of living form the basis of other chapters. Reyita actively participated in the life of the community--often caring for the children of prostitutes along with her own eight children and giving herbal medicine and "spiritualist" guidance to ill or troubled neighbors. She describes her growing resistance, over five decades of marriage, to her husband's sexism and negativity. Strong-willed and frank about her sexuality as well as her religious and political convictions, Reyita recounts joining the revolutionary movement in the face of her husband's stern objections, a decision that added significant political purpose to her life. At book's end, Reyita radiates gratification that her 118 descendants have many different hues of skin, enjoy a variety of professions, and--"most importantly"--are free of racial prejudice.